Bob Schaper is a former Marine Corps pilot now anchoring and reporting in Eugene. From Missouri, he's open to just about all areas of the country. Contract ends 6/23/2018, but has a top 50 out now. Please consider him! See all of Bob's clips. Evening Anchor/Producer (July 2017 – present). Solo anchor and produce the 11 p.m. newscasts. Night crew supervisor. Constant use of social media to engage viewers. Team player and multi-tasker. Morning Anchor-EP (June 2013 – July 2017). Helped drive ratings from solid No. 2 to dominant No. 1 in 18 months. WTVO-TV, Rockford: ME-Evening Anchor (June 2012 – August 2012). WKOW-TV, Madison: Capitol Bureau Chief (February 2010 – February 2011). WREX-TV, Rockford: Reporter (September 2008 – February 2010). Register Star, Rockford: Four awards from the Associated Press and Gannett. Asst. Metro Editor (August 2007 – September 2008). Reporter (November 2004 – August 2007). Commerce Magazine, St. Louis: Managing Editor (January 2004 – November 2004). Various Employers, St. Louis: Freelance Reporter (September 1998 – January 2004). Two awards from the Society of Black Journalists. The Boeing Co., St. Louis: Aircrew Instructor (February 1993 – September 1998). Managed six-month, ten-member team project in Rota, Spain, delivering multi-million dollar AV-8B Harrier II maintenance training course to the Spanish Navy. Trained F/A-18 aircrews aboard USS Independence. Instructed pilots from Israel and Saudi Arabia in F-15 simulator. U.S. Marine Corps: Officer-Pilot (September 1986 – October 1991). Flew AV-8B Harrier II single-seat attack aircraft. University of Missouri-Columbia: A.B., Radio, TV & Film. Volunteer for Habitat for Humanity, Boy Scouts of America, Alzheimer’s Association and others. Author of six novels. Matt Templeman (current supervisor), News Director, KEZI-TV, Eugene, 541-513-6399. Joe Radske (former supervisor), News Director, KVRR-TV, Fargo, 262-366-1259. 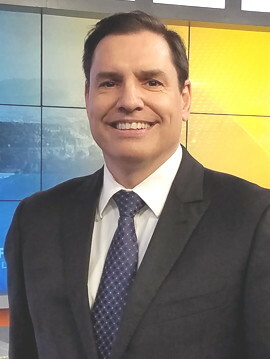 Greg Hasser (former supervisor), Executive Producer, KATU-TV, Portland, 317-373-4976.